On their website, EagleRidge (ER) claims to use best practices. Practice Green Completions – Since the formation of EagleRidge Energy, LLC (ERE) in January of 2009, ERE has performed “green completions” on all of its gas wells in Denton & Wise County. But, as you can see from the videos of fracking flowback emissions taken in Denton HERE, and HERE, that is not a true statement. In fact, I have not witnessed ER using green completions on any operation in Denton. 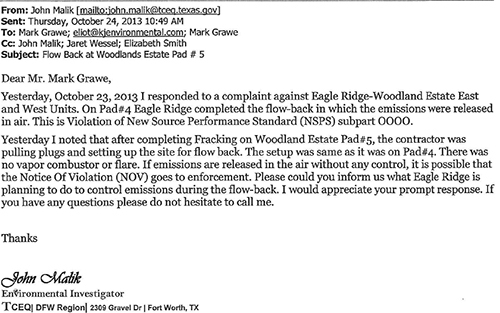 And in Mansfield, ER received an all too rare violation from the TCEQ for allowing flowback emissions to foul the air. Update: Here is an industry presentation about Green Completions also called Green Flowback Process. It does not involve venting or flaring. Mark Grawe, the quick tongued ER COO, told a TCEQ investigator that ER would preform a green completion in Mansfield and would use a thermal oxidizer to control emissions to the air. In Grawe’s reply it is obvious that he intends to vent rather than follow the law. It’s just too hard to find that thermal oxidizer thingy and breaking the law in Texas is actually cheaper. Venting toxic compounds into the air is no big deal if it’s not in your neighborhood where your children sleep and play. This is a clear indication that fines are meaningless to the oil and gas industry. 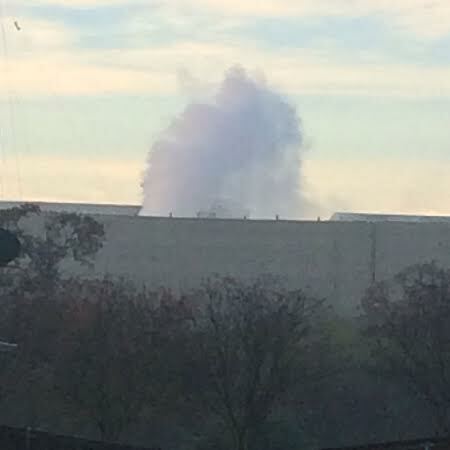 This video of flowback “venting to atmosphere” was taken by the TCEQ during the investigation of this Woodland Estates complaint and it looks much like what is happening in Denton right now. On pages 2 and 3 of the report, you will see that the City of Mansfield does not allow venting or flaring (please take note, City of Denton). Grawe tried to use this as an excuse saying the nitrogen level of the gas was too high to send through a pipeline so what else could they do but vent and expose the neighbors? The TCEQ investigator explained that an operator must find a way to comply with both the city and the federal code. There isn’t a choose one option on following the law. Grawe only needed to get the thermal oxidizer mentioned in the previous investigation report, which has internal combustion so would not violate the Mansfield no flaring ordinance. This was likely a business decision on Grawe’s part. Not following the law is likely more economical than following the law. That’s how we roll in Texas! The Woodland Estates neighborhood in Mansfield, Texas has been exposed! 25 detectable compounds. This is significant because co-exposures of two carcinogens–even at safe levels–doubles your risk of cancer. And we are learning more about how the mixtures of chemicals can magnify the effects. These chemicals are associated with the natural gas flowing back to the surface as well as the chemicals in frack fluid. From previous testing during flowback operations in the Barnett Shale, we know that many dangerous compounds are released into the air at very high levels. On October 25th, ER decided to route the flowback at the Woodland Estates operation to a combustion device. No such decision has been made regarding the flowback in Denton. Because ER did eventually use the combustion device, the violation is considered resolved so there will likely be no fine. And that’s how we roll in Texas. Can’t find a thermal oxidizer? Even I know where you can one. In fact, you may recall my significant other tracked down the manufacturer when the one ‘we’ had was malfunctioning because it was not installed correctly. How about this- either the wells get shut down until it’s installed, or we do live monitoring and Grawe pays $100,000 a day fines until they do.